Since the 2007 Jović Vranac currently stands as the highest-rated wine on this (newish) blog, I was delighted when the importer, Goran Sevic of Vino et Spiritus, invited me to taste more of his Serbian wine portfolio. 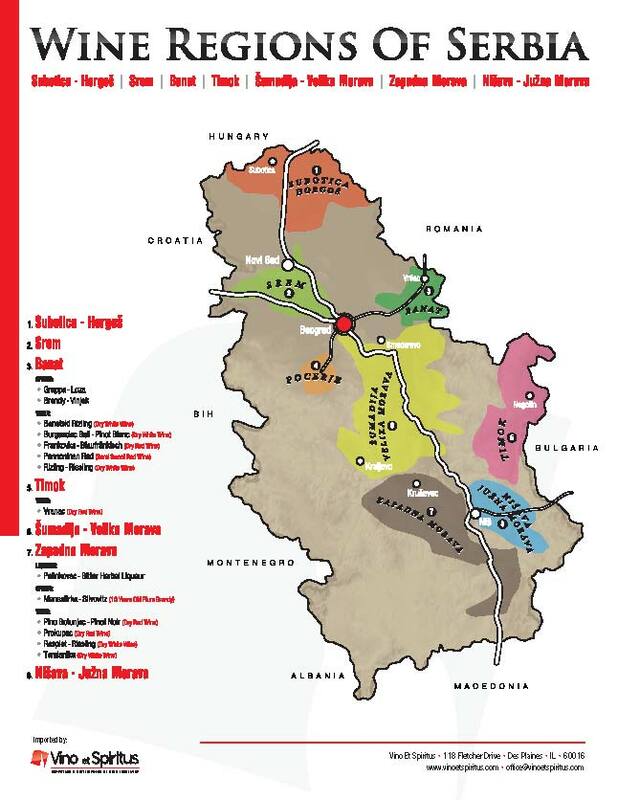 It’s rare to find even one bottle of Serbian wine — wine regions like Banat, Timok and Zapadna Morava don’t leap readily to the tongue — let alone have the opportunity to taste several all together. Fortunately the food poisoning I’d experienced the day before the tasting abated, and I paid Mr. Sevic a visit. We couldn’t be expected to taste all this wine on an empty stomach, a most hospitable Mr. Sevic declared, and he produced a beautiful board of Serbian sremska sausage, Serbian pancetta, Italian sausage, Jarlsberg cheese and slices of baguette. Unsure how my almost entirely empty stomach would respond, I started with a bit of baguette. Reassured by my gastric non-reaction, I sampled the first wine. We started with a 2009 Ivanović Tamianika from Zapadna Morava in southern Serbia. My research yielded little about this Serbian variety (more commonly spelled “Tamjanika”), other than that it’s a relative of Muscat. Mr. Sevic, and the wine’s label, for that matter, confirmed this fact. Wikipedia asserts it came from southern France to Serbia 500 years ago, but it cites no source for this information. A blog I found notes that some people find it smells like incense, and indeed, tamjan is the Serbian word for incense, according Google Translate. I didn’t detect incense in the nose of the pale yellow Tamianika (actually a blend of 85% Tamianika and 15% Riesling); I got a wonderful whiff of ripe pineapple and wet stone. Flavors of apple transformed into something spicy. Incense? Perhaps, but to me the spiciness tasted almost like ginger. The Tamianika finished with some bracing minerals, completing a wonderful ride. The Ivanović winery had stagnated under communism, but vintner Dragoslav Ivanović found his grandfather’s old winemaking notes and rejuvenated the family business, creating small-batch, organic wines sourced from nine tiny vineyards in Zapadna Morava, each under an acre. (The wines are not certified organic, incidentally, because Mr. Ivanović would “rather buy his wife a new dress than pay for certification,” according to Mr. Sevic.) Mr. Ivanović’s care clearly shows; his expressive Tamianika tasted delicious. We tasted another wine produced by Ivanović, the 2008 Prokupac, a blend of 85% Prokupac, 10% Cabernet Sauvignon and 5% Merlot sourced from just 5.6 acres in the same area. This chewy, tannic, dark red wine featured a heady nose of leather and brandied cherries, and flavors of red meat, tobacco and ripe raspberries. It tasted even bigger when paired with the smoky Serbian sremska sausage. Prokupac clearly warranted some additional investigation. Wine Searcher offers precious little about the Prokupac grape, and Wikipedia and the Oxford Companion to Wine (via Wine Pros) offer little more. Vino et Spiritus writes that Prokupac is an indigenous Serbian variety, which, according to Wikipedia, dates back to the Middle Ages. Though almost entirely unknown outside its homeland, I hope we’ll see more of this variety on the market in years to come. Up Next: What Serbia can do with Riesling, Blaufränkisch, Vranac and the ever-fickle Pinot Noir. 2009 Ivanović Tamianika: An aromatic, complex delight with flavors of apple, ginger and stone. Chill, and remove from the refrigerator 5-10 minutes before serving. 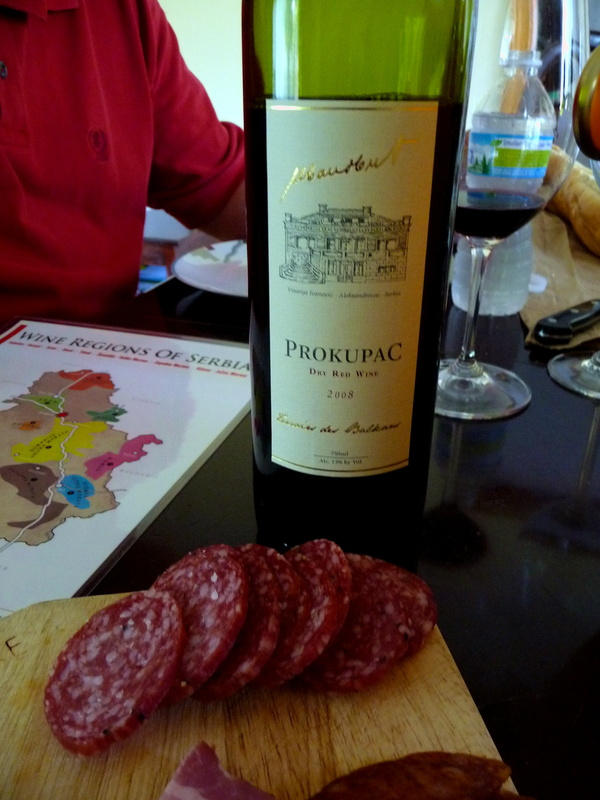 2008 Ivanović Prokupac: A chewy, hearty, meaty red, tasty with smoked sausage and surely also with steak or pork. Chill in the refrigerator about 10 minutes before serving.